I’d always thought dips were a bit of a cop-out. I’ve been to so many potluck meals where there is an abundance of chips and hummus and not much else for anyone plant-based, and you usually come away feeling hungry because it’s just not enough food. This was until I discovered a beautiful little restaurant which had the most delicious 5-layer dip on its menu. The amazing thing about this dip was that the combination of layers meant it was like eating a full meal. I never found out what was in it but it was so tasty and satisfying that I promised I’d try and recreate it myself. And as the heat of summer is here it seems like the perfect time to share a no-cooking (and easy to prepare) recipe! If you’ve been following along for a while you’ll know that I also love collaborating with local vegan-friendly businesses, and this recipe is no exception. I was lucky enough recently to meet the lovely Andrea of Solecito Salsas. These salsas are made locally by Andrea’s family in Vancouver BC, and combine fresh high quality ingredients with authentically Mexican recipes. I didn’t think I was a big salsa fan; after trying their Salsa Roja however, I was proved wrong! It’s absolutely delicious, and I’ve found myself craving it ever since. It contains no sugar and is naturally vegan and gluten-free, which makes me happy. This salsa tastes fantastic in almost any dish as the flavours are abundant but not overwhelming, and is of course also amazing eaten on its own with tortilla chips. 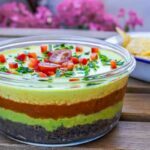 The recipe for this 4-Layer Vegan Summer Dip combines Solecito’s Salsa Roja with some of my favourite Mexican-inspired ingredients, such as avocados and black beans. It’s so filling you could eat it as a meal on its own (although I’m a fan of having a salad with it just to get in some greens.) 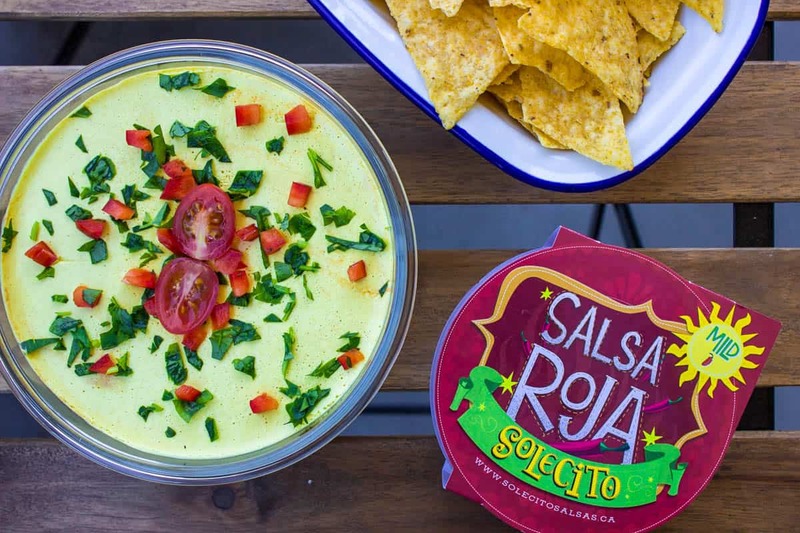 If you can’t get hold of Solecito Salsas in your part of the world never fear – a pot of your favourite salsa will do (almost) as well! For the first layer, blend the beans, garlic, chipotle, chilli powder, cumin, soy sauce and water together for about 30 seconds until the mixture is fairly smooth but still has some texture. 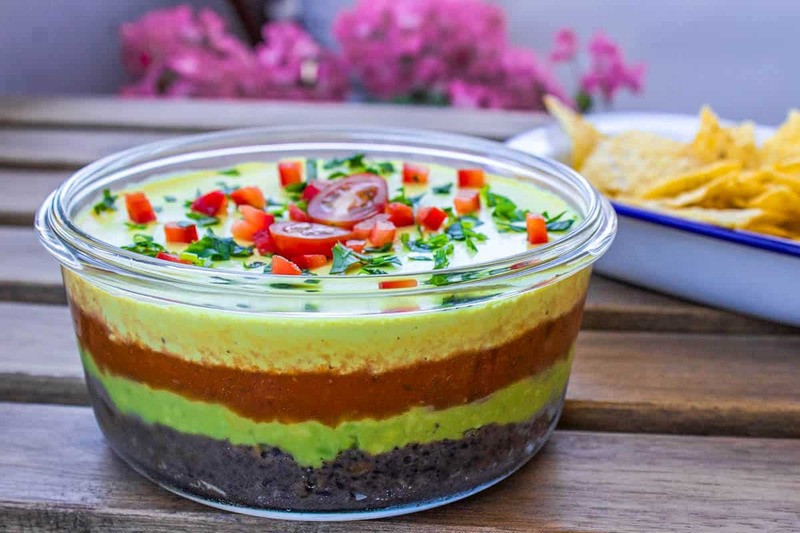 Spoon it into a 7-inch round container with a lid (I like to use a glass one to show off the layers of the dip), and using a spatula smooth the dip’s surface. To make the second layer, in a medium-sized bowl mash the avocados, lemon juice, garlic and salt with a fork. Do this until the mixture is combined, but still quite lumpy. Spread this layer on top of the bean mixture in the glass dish. For the third layer, simply pour your pot of salsa over the guacamole layer. Place the lid on the container and put it in the freezer while you make the final layer (I like to do this because the salsa can be a bit runny, and putting it in the freezer really helps it to firm up). To make the final ‘cheesy’ layer, blend all remaining ingredients (cashews, nutritional yeast, chipotle, garlic powder, coconut milk, water and salt) on high power for about one minute. If you aren’t using a high speed blender you may need to blend for a little longer to get a really smooth texture. Remove your container from the freezer and spread the mixture over the other layers. 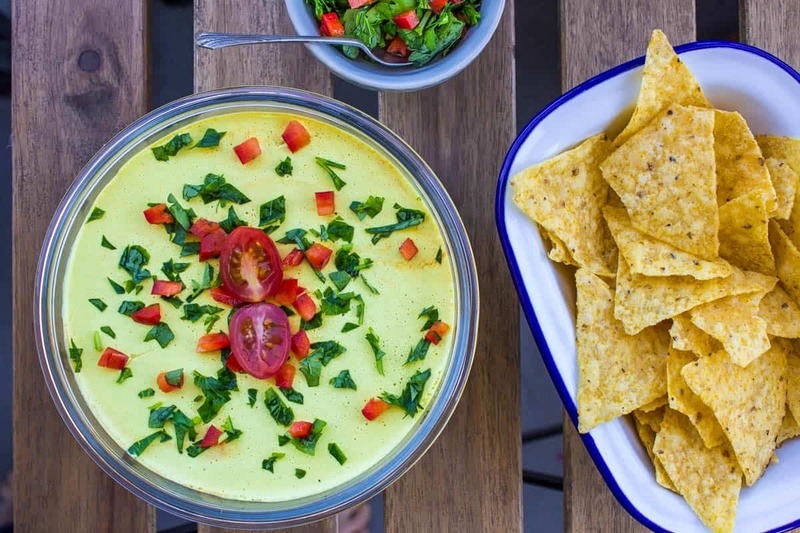 Put the finished layer dip in the fridge for 30 minutes-1 hour to firm up, then serve with tortilla chips or crudités.